Stia – These aren't gray hairs, these are highlights! A year ago, I took the bus from Florence to Stia in order to visit Castello di Porciano. At the time, Stia was just the place where I got off the bus. Little did I know how much more familiar with it I would become! That first time, our host picked us up at the bus stop, then took us to the square. At a bar, we had a caffé (cioccolata calda for me) and pastries. I’ve been to the bar several times since – when I make the round-trip walk from Porciano to Stia, the way back is all uphill, so I need fortification! In the town square are Pieve di Santa Maria Assunta, restaurants, and shops, including one that sells items made of the famous Casentino wool. Compared to some of the grand churches I’ve seen, Santa Maria Assunta is simple, but I’ve grown fond of these small village churches. Very often, there are just one or two beautiful artworks and because of that, it’s easier to appreciate them. 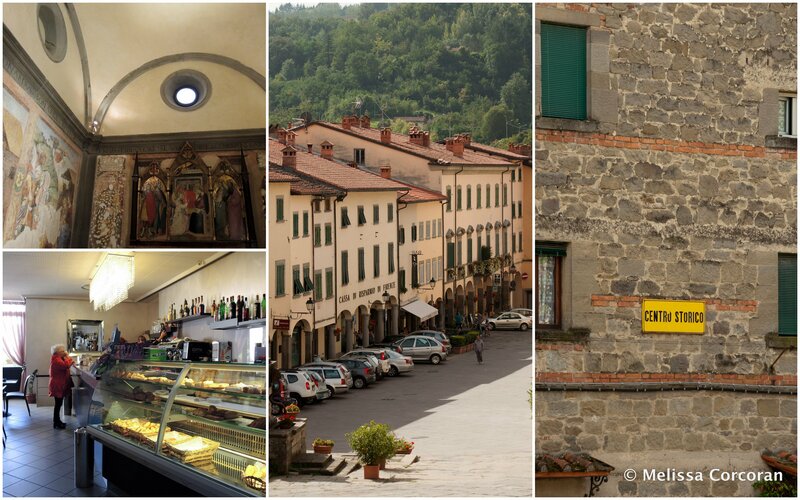 Counter-clockwise from top left: Pieve di Santa Maria Assunta; the bar with pastries; the town square; sign indicating the historic center of town. In the square, there’s also a hair salon, where I got a great haircut and one of the best shampoos ever. While we were waiting for the stylist, I noticed a display of old hairdressing equipment, including something I’d read about but never seen: a permanent waving machine. Walking out of the square towards the rest of the town, a left turn brings us to the Museo dell’Arte della Lana (aka the wool museum). This was a place I wanted to visit, but still, I was surprised at just how great the museum was. 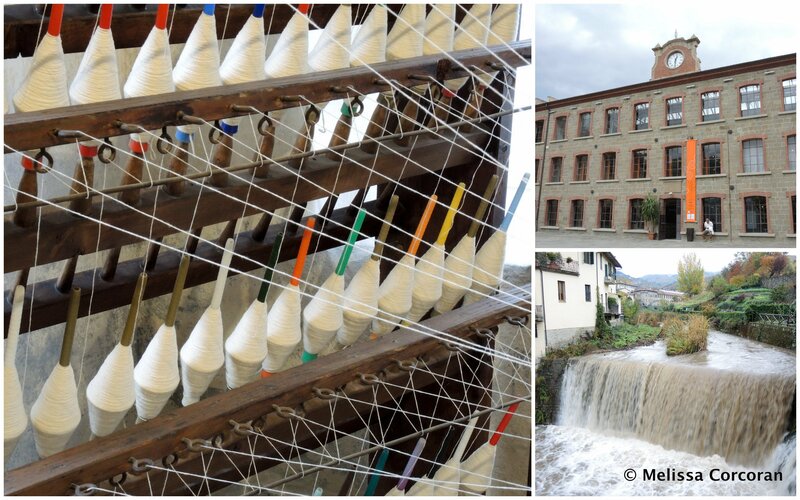 The path through the museum starts with the context of weaving in antiquity, moves on to the history of wool making in the Casentino, then into detail about the weaving process, from shearing to refinishing. Another section details the rise and fall of wool production in Stia, a story sadly familiar to someone who has lived in New England for many years. An interesting feature of the museum is the ability to hear what various machines sounded like by pushing a button. I also like that the color scheme echoes the traditional orange of Casentino wool. Clockwise from the left: bobbins of thread in a display in the wool museum; Museo dell’Arte della Lana; the Staggia River after rain. Walking away from the museum along the Staggia River, which powered the mill, we come to the main road, Via Adamo Ricci. Along this road are some of my favorite places, one of which is Caranbar. We had lunch here the first time I came to Porciano and I’ve eaten there many times in the last several weeks. I’ve tried various items on the menu, but my favorite is the tagliata with sprigs of rosemary. Further up the street is the pasticceria , where I often buy bread, and a small grocery store that has wonderful produce. The man who bags the fruit asks when you plan to eat it so that he can pick pieces with the right degree of ripeness. Opposite the modern town square, with its children’s playground and tables where people bring their aperitivi from the bar across the street, is the gas station. I like the gas station because a) this is where we learned how to ask for gas in Italian and where I figured out how to use the self-service option and b) the man who works there during the day is so nice. 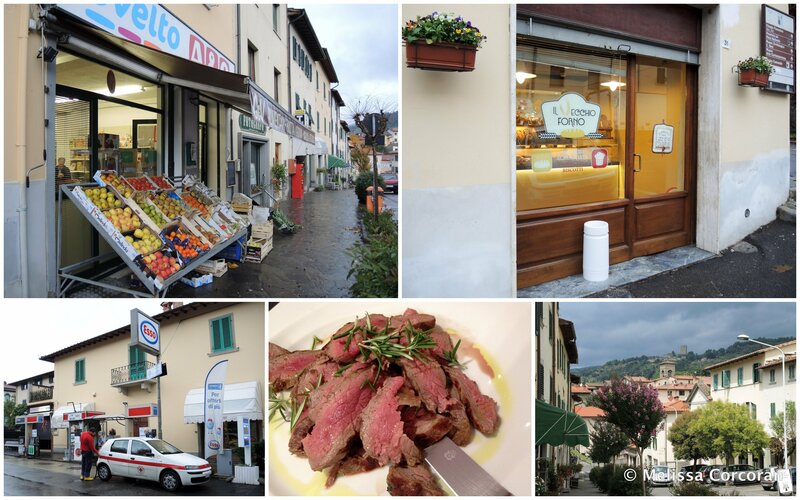 Clockwise from top left: fruit at the grocery store; the pasticceria; Via Adamo Ricci; tagliata at Caranbar; the gas station. Continuing up the street, which is now Via Roma, is a cemetery. Entering the cemetery, there is a monument to the seventeen partisans executed in Stia on April 17, 1944, as well as their graves. One of the surprising aspects of the back section of the cemetery is that it is not maintained, which is unusual in my experience. It’s a lonesome place, but still lovely. 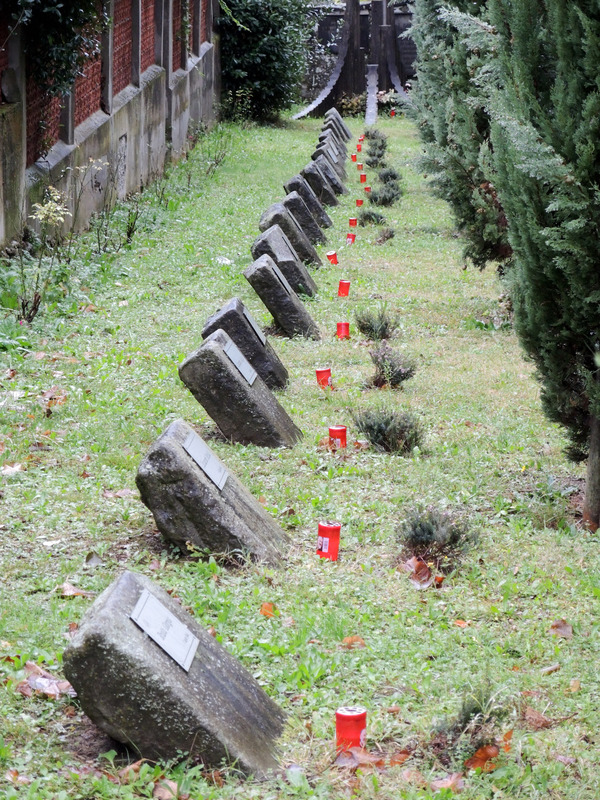 The graves of the executed partisans. Further along the road is the Coop, the grocery store where we frequently shop. On a day when no one wants to cook, the roast chicken and potatoes are a godsend! Stia is a small town and at first glance, not charming in the way Poppi is. I like it, though – it’s ringed around with good memories of the people and the experiences I’ve had there. That is one of the very bestest compliments I ever received!